Revised Minimum Wages & VDA per day w.e.f. 01.10.2017 for Un-Skilled, Semi Skilled, Skilled & Highly Skilled Industrial Mine Workers - For work above ground or below ground, F.No.1/13(2)/2017-LS-II, Government of India, Ministry of Labour & Employment, Office of the Chief Labour Commissioner(C), New Delhi, Dated:6/10/2017, ORDER, In exercise of the powers conferred by Central Government vide Notification No. S.O.2413(E) dated 28th July, 2017 of the Ministry of Labour and Employment the undersigned, hereby, declares that there shall be no increase in Variable Dearness Allowance for the period of 1.10.2017-31.3.2018 due to decrease in the average Consumer Price Index for the period January, 2017 to June, 2017 for the workers employed in Industrial Workers and thereby resulting in the VDA remaining the same as it was during the period of 1.4.2017 to 30.9.2017. This order shall come into force w.e.f. 01.10.2017. In exercise of the powers conferred by Central Government vide Notification No. S.O.2413(E) dated 28th July, 2017 of the Ministry of Labour and Employment the undersigned, hereby, declares that there shall be no increase in Variable Dearness Allowance for the period of 1.10.2017-31.3.2018 due to decrease in the average Consumer Price Index for the period January, 2017 to June, 2017 for the workers employed in Industrial Workers and thereby resulting in the VDA remaining the same as it was during the period of 1.4.2017 to 30.9.2017. This order shall come into force w.e.f. 01.10.2017. 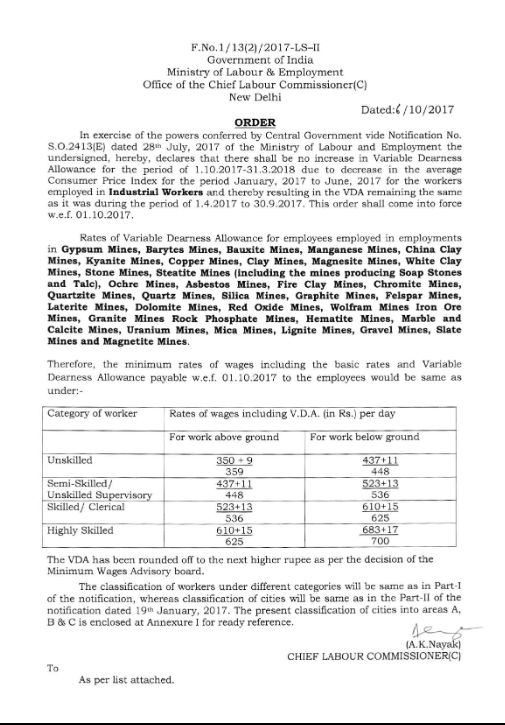 Rates of Variable Dearness Allowance for employees employed in employments in Gypsum Mines, Barytes Mines, Bauxite Mines, Manganese Mines, China Clay Mines, Kyanite Mines, Copper Mines, Clay Mines, Magnesite Mines, White Clay Mines, Stone Mines, Steatite Mines (including the mines producing Soap Stones and Talc), Ochre Mines, Asbestos Mines, Fire Clay Mines, Chromite Mines, Quartzite Mines, Quartz Mines, Silica Mines, Graphite Mines, Felspar Mines, Laterite Mines, Dolomite Mines, Red Oxide Mines, Wolfram Mines Iron Ore Mines, Granite Mines Rock Phosphate Mines, Hematite Mines, Marble and Calcite Mines, Uranium Mines, Mica Mines, Lignite Mines, Gravel Mines, Slate Mines and Magnetite Mines.